Katie Straton is a USDF Silver and Bronze Medalist, passionate dressage trainer, coach, and competitor based in Westminster, Md. She is committed to developing each horse and student through classical training principles, and prioritizes the happiness and well-being of the horses in her program. 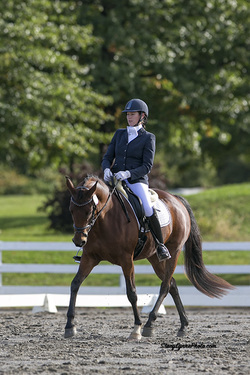 Katie enjoys sharing the beauty of classical training in the show ring and is actively pursuing her USDF Silver and Gold Medals with her new mount, Theopolis Thisla W. She is currently an active committee member and volunteer in the Potomac Valley Dressage Association, and serves as Chairman of the PVDA New Market Chapter. Growing up in Lexington, Virginia, Katie gained a rich background of experience with horses. She began riding lessons at age 10, although her obsession with horses began at much younger age! Katie was fortunate enough to keep her first horse Patches, a 4yo Appaloosa mare, in her own back yard. She joined the local 4H club which exposed her to a variety of disciplines, including western riding, fox hunting, and sidesaddle. Her green mare eventually took her from her first hunter pace to her first dressage show. At age 16, Katie joined the local Pony Club, which exposed her to the world of eventing. She competed in Pony Club Rallies as well as local shows throughout Virginia. While attending college she became a working student for eventer Teresa Kemp. She then moved to Maryland to work for Advanced Level eventer Natalie Hollis. Katie competed successfully through Training Level eventing in Area II and earned her USPC C3 rating. She spent the next several years managing training barns, and riding for trainers of hunters, jumpers, fox hunters, and race horses, before discovering her passion for dressage. This led her to work for several Maryland based dressage trainers until she was offered a position to manage the training barn of FEI trainer, Jessica Jo Tate. Katie worked for and rode for JJ for several years before starting her own training business and still considers her a mentor. She also spent several years working as an equine veterinary assistant for Dr. Michael Odian while building her training business and managing her own barn. Katie now operates her active training and lesson program at Sunset Ridge Farm in Mt. Airy, Md. Katie's drive to grow as a trainer and her commitment to following classical principles are reflected in her enthusiasm for her daily work. She regularly attends clinics and other educational events, and humbly accepts the lessons her horses have to offer each day. She has been training with JJ Tate since 2007, and with noted classical dressage master Charles de Kunffy since 2004. Katie has also ridden with clinicians George Morris, Jim Wofford, Richard Williams, Dr. Ulf Moller, Uwe Steiner, and Michael Barisone. Kerri has been around horses her entire life. As the daughter of devoted horsewoman, Lesley Long, it was in her blood from the start. She spent her early years riding (and being bucked off by) a variety of small horses and ponies. When she was old enough, Kerri began volunteering at Days End Farm Horse Rescue. She worked at Days End for 3 ½ years, gaining an incredible amount of knowledge on horse health, anatomy, and behavior. At the age of 13, Kerri and her mother moved to Waters Edge Farm to train with Advanced Level event rider Natalie Hollis (of Destination Farm). It was there that Kerri developed her riding skills and learned everything about the sport of Eventing. As a working student, she gained valuable experience caring for horses, grooming at shows, and receiving lessons and coaching. Kerri had the opportunity to ride and train a multitude of horses: green off the track thoroughbreds, upper level event horses, horses with training issues, and un-backed youngsters that she started under saddle. Kerri has groomed for many top professionals including Buck Davidson, Jane Sleeper, and Hunter/Jumper trainer Kim Williams. She has worked for Dressage trainer Marjorie Davis and foal watched at Sagamore Farm for manager Tom Mullikin. Kerri has also had the experience of running her own training and boarding operation alongside her mother, and has successfully re-trained and sold many OTTBs. Kerri has competed many of her own horses, as well as numerous client horses, at events from Beginner Novice through Intermediate Level. She has ridden in clinics with Phyllis Dawson, Buck Davidson, Don Sachey, Leslie Law, Steeplechase rider Chip Miller, and Timber rider Anne Moran. Kerri now specializes in re-training off the track thoroughbreds and starting young horses under saddle. She also enjoys instructing and coaching riders of all levels, helping them to improve their relationship with their horse.